All without us ever feeling in any way deprived or worse off than others. As I struggle with our chaotic, overscheduled household and the teetering economy, I wonder how my mother did it. I find myself striving to follow her examples of balance, frugality and stewardship. Did she possess these traits because she experienced the austerity of the Depression or because she absorbed the German values of thrift and resourcefulness? I know that she embraced rationing during the war years, for I found her books and leftover stamps in the attic and I've tasted the awful oleomargarine. I'm sure she drew lines down the back of her legs to make it look like she wore nylons, an item unavailable during the War. That was, until she won a pair of genuine nylons during a drawing at the local Elks Club. The photograph in the newspaper says it all as she holds the long pair in the air, a big smile on her face. When she joined my father to raise a family, she had none of the household skills needed. She often told us she didn’t know how to boil an egg when she married in 1938. And certainly she didn’t learn to strip and reapply varnish, make all her and her five daughters’ clothes, tailor our suits and coats, or knit our sweaters and dad’s argyle socks until much later. Eventually she became the capable manager of our home in all its realms. She so skillfully managed our budget, our purchases, and our 'making do' that we never suspected we were often about to sink rather than swim. My mother was born the sixth child in a family of nine…three sons and six daughters. She delighted in telling people that her mother had three and a ‘half dozen’ children. She was favored by her father and being one of the youngest, probably wasn’t responsible for many chores. The fact that she became the rock and foundation of our family was due to her determination to learn her generation’s new ways of being a wife and mother, which meant hands-on parenting and running a seamless household with only her own efforts and ‘elbow grease.’ No live-in help like her mother was priveleged to enjoy. Nor did my father’s meager salary allow such luxuries. My mother probably didn’t realize that the lessons of frugality learned as a child were set into motion long before she was born when her mother chose a life with more hardship than was planned for her by her successful, Catholic parents. Both had immigrated from Luxembourg during the 1850s, her father secure in the legacy of his aristocratic family. My mother never knew these grandparents and perhaps that is a good thing, since her mother did not marry the man they had encouraged her to choose (said to be a dentist) and was cut off from the family. Instead my grandmother chose my grandfather, the son of northern German Lutheran emigrants who opened a hotel and saloon soon after they arrived in 1866. My grandfather’s father spent time in jail for serving beer in defiance of Iowa's early prohibition laws. Grandpa was orphaned at age 15 and learned the skills of a barber from his uncle. To supplement his income, he ran a card room in the back of his shop. Wrong religion, wrong class, wrong parents, a tradesman who consorted with gamblers, and an orphan to boot…definitely not the husband for their well educated, sophisticated, talented daughter, a young woman who spoke four languages, taught school and piano lessons, and was later a published author. My mother, then, grew up in a home that watched her mother’s siblings succeed financially and in their professions, while her family struggled. My grandmother did have support from some of her family. Her brother, the doctor, visited her daily for a shared glass of sherry and conversation. Perhaps he slipped my grandmother some cash to help pay for the hired farm girls, Sophie and later, Frances, or the twice-a-year visiting seamstresses. I also suspect that he may have provided funds to send my mother’s younger and gifted brother to college and if he, her brother, had not died suddenly before he could graduate, to medical school. By the time it was my mother’s turn, going on for more education (she longed to be a nurse like her older sister) or taking piano lessons were out of the question. Instead, she encouraged me to apply to nursing school and saw to it that all five of us took piano lessons for ten years or more, arranging for us to dust the pianos in exchange for lessons. My mother never used credit, kept a record of every penny spent, borrowed only when there was a medical emergency, saved for major purchases or did without, and paid all year on the no-interest Christmas Club for Santa’s generous gifts under the tree. She made all her and our clothes, sometimes tailoring our wool coats from our neighbor’s old ones. She learned to knit, to garden and then to can the abundant produce, to render lard, to forage in the fall for berries, watercress, and nuts, and to bake bread and coffecake every Saturday, using the left over potato water. By the time her five girls came along, she was a good cook and baker, serving three multi-course meals a day, each one a favorite of one of us. She put the remnants of bar soap in a strainer to make the suds to wash dishes. Our toothpowder was a mixture of baking soda and salt. Our juice glasses were once jelly glasses. She arranged for us to babysit, to get jobs to pay for our private girls’ school tuition, and to borrow our cousins’ prom dresses and their Nancy Drew and Cherry Ames books. We had an old fashioned ice box until the year my mother entered a contest and won a Shelve-a-Door refrigerator. She broke her neck after diving in shallow water on the 4th of July that year and was paralyzed for six months in a body cast, unable to care for her three daughters, one just four months old. She must have thought this certainly qualified for a twenty-five word or less winning sob story but it also spoke to her resourcefulness in the face of adversity. My mother saved and found a new use for everything. The day my sister and I helped her pack up her belongings and move with us to Seattle, I found (and keep to this day), her bundle of used twisty ties, all secure in a rubber band. I’ve inherited this German trait and for a long time, felt it was a curse not to be able to throw anything out. But in the current climate of cutting back and doing without, perhaps making do and using again is the best way to honor my mother’s stewardship and to be a good citizen. I was eleven years old and in sixth grade when Jeanne, the fourth of us five sisters was born. Holz’s Harem, Dad lovingly called us. From the beginning, she was special. She had dimples; none of the rest of us did. Well, maybe Carolyn had a couple. She had a lovely long curly strawberry-blond pony tail that reached below her waist; the rest of us could barely coax our hair to grow to our shoulders. She loved all animals, especially horses and dogs, while a few of us were afraid of dogs, including Sparky, our untrained Springer Spaniel who nipped whenever he had the chance. 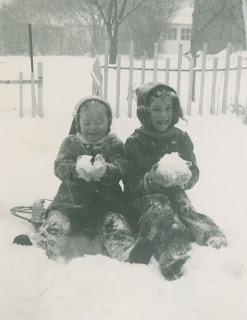 I loved being the big sister and taking Jeanne and Ann, my two youngest sisters, on character-building adventures. One summer when they were about six and eight, I decided that they needed to experience the day hike to Catfish Creek that all hearty Dubuquers took. In helping them build up their confidence to face the unknown dangers of the wild, I nearly got us killed. Just after I pointed out the rattlesnakes sunning on the rocks, I lead them across the wooden train trestle at the very moment a train rounded the bend. There was only one escape. Quickly stepping on the railroad ties to reach the other side, we had to concentrate on not getting our feet caught in the spaces between. We jumped into the weeds and made it with racing hearts and inches to spare. I think I made Jeanne and Ann swear they would never tell anyone what happened that day, especially Mom and Dad. We spent a lot of time together as a family, including memorable summer vacations at Lost Lake in northern Wisconsin. I gave them their first Barbies, complete with the now valuable outfits. I had Mom send them alone not by one, but by two trains to visit me in Rochester, Minnesota, where I worked at the time. A few years later, I took them to the Peterson farm in western Iowa. They drove the tractor, fed the pigs, chased the kittens in the barn, rode the horses. And were horrified when, right before their eyes, Fern hacked off the head of the chicken she was going to prepare for supper. Jeanne grew into a quietly beautiful young woman. She was generous with her concern and interest, always observing and listening, always giving the wisest advice. Throughout her life, Jeanne attracted and kept a wide circle of loyal friends. She was also generous with her talents, whether it was her exquisite stitching, her wholesome cooking and baking, or her sage nursing advice. She offered comfort whenever we hurt, either physically or emotionally. She was never judgmental. Jeanne was generous with her time. One of the best gifts she ever gave me was the time she arrived unannounced in my kitchen to help me prepare for a large dinner party. She proceeded to cut and mince and clean until everything was ready. Oh, and she volunteered to be our companion when my one-year-old daughter and I drove a huge rental truck cross country to move to Seattle. Later, she followed her four sisters to Seattle to live, work, marry, and raise her son. Jeanne was an excellent seamstress and creator of cross-stitched gifts. She made dresses for her nieces’ infant daughters’ first birthdays and colorful quilts for her friends. She joined her sisters in creating the first two sisters’ quilts, winning the drawing for the first one. Her wedding present to her sister, Ann, was a beautiful bear claw quilt that she made entirely by herself. She loved to cook and to bake and was committed to natural ingredients and healthy living long before they were trendy. She loved to garden, nurturing the plants selected with her niece, Emily, for her new garden design. Jeanne loved the outdoors, whether it was camping at the ocean or at Lake Chelan's camp ground, cross country skiing, or biking. One of her first jobs was as a camp nurse at Camp Conestoga and not for one year but for three. Jeanne was an avid Mariner’s baseball fan, taking her son to games whenever possible. She also loved taking him to Disneyland and Disney World and Yellowstone National Park, returning to each several times. 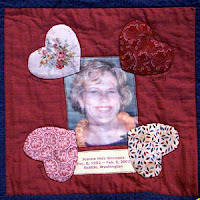 Jeanne was a skilled nurse much admired and honored by her colleagues in Seattle’s Swedish Hospital Special Care Nursery. There, you will find her portrait and a beautifully written tribute near the nurses’ station. She loved babies, especially her own son, her nieces and nephews, and eventually their children. She would arrive at the hospital as soon as possible after birth to hold and gaze at the new arrivals and during many visits once they were home. Using her solid experience and education, she had ready tips for the new mothers in our families on infant care, nursing, and feeding. Jeanne drew on her faith for strength and for ways to be the best person she knew how. She never announced her beliefs; you simply knew from her actions that she had a firm moral and spiritual core. Jeanne faced her cancer and its many setbacks with uncommon courage and trust and hope even when the health care system failed her. Still, she carefully put all her affairs in order to ensure that her young son would have college as an option if, later, he should so choose. 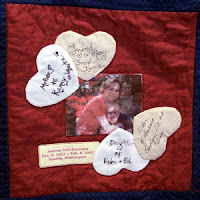 Here are photos of two quilt blocks created by her four sisters for the first Quilt of Courage, sponsored by the International Myeloma Foundation. 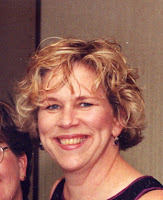 I think of Jeanne every day and miss her terribly. Her brief life touched us in ways she probably never realized. I know I didn’t tell her often enough how much she meant to me and to all of us. She is one of the few women I most wish to be like. Click here to view a slideshow of Jeanne through the years. Just double click on the photo to see a larger view. Winter in Rochester as I remember it in the late 1950s. 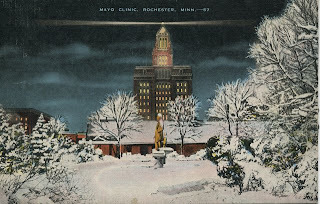 Since we were only allowed two visits home that first winter in nurses' training at St. Mary's, we often trudged the long blocks downtown for a break, where the sole Mayo Clinic building towered over the city. 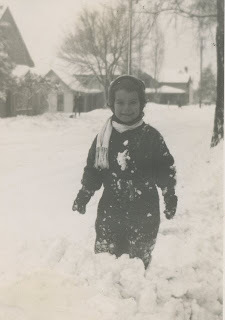 Were severe winters so commonplace in Iowa that my ancestors didn't choose to photograph them? I found only these in my collection. And, did 1943 to 1949 see record snowfalls in Dubuque? And if not, why did my father take only these? The first photo was taken about 1943 and I'm standing next to a family heirloom that I would dearly love to find. I was told that my great-grandfather, M. F. Michels, a skilled carpenter and painter of detailed and exquisite embellishments on the passenger cars for the Milwaukee Railroad at their shops in Dubuque, handcrafted this sled, perhaps for my father, his grandson. It was a deep maroon and the scene in front is of a deer and other animals in the forest. 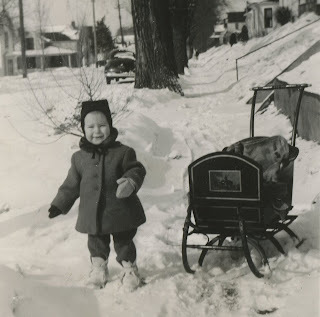 After I left home to start nursing school and as my parents moved into their second home, my father donated many beautiful family pieces from his childhood, including this sled, to St. Vincent de Paul. I never dreamed I had to ask to keep it. 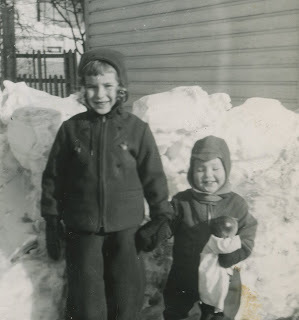 This photo was taken the winter of 1944 in our backyard in Dubuque, Iowa. It looks like I struggled to make it this far, falling a few times. Not long after, I'm sure I sat inside next to the heat register from our coal furnace, trying to get warm, a favorite place for my sisters and me to dress during the cold winter mornings. By February, 1947, when the following photo was taken, my sister, Carolyn, had arrived. Here, she and I stand guard over a fort my father made by piling the snow until the walls were higher than my shoulders. My winter memories are of deep, deep snow. Now I know why...I was a lot shorter back then. The last photo was taken during January, 1949. My second sister, Liz, was to arrive two months later. The snow looks too cold to pack into perfect snowballs, a common problem during our cold, cold winters. But we could eat it.